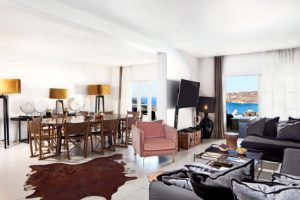 Myconian Villa Collection is an exquisite luxury villa resort on the island of Mykonos for discerning travelers seeking an indulgent getaway with discreet and personalized services and amenities. From romantic escapes for couples to idyllic hub for families and friends to come together, the Collection provides the perfect setting for the best memories of the year. 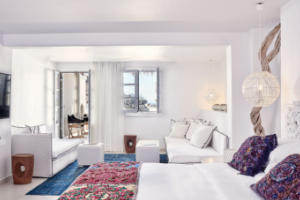 With panoramic views over the Aegean, steps away from the famous Elia Beach where private loungers and umbrellas await, the property offers an alluring pool deck and individual villas with private infinity pools. 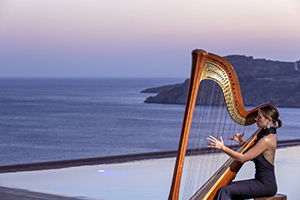 Located high above Elia Beach, a destination in its own right, famed for its aquamarine waters and fine sand. 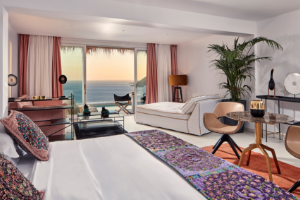 43 spacious guestrooms, suites, and villa experiences captures the essence of villa lifestyle luxury with attention to detail and private Jacuzzis or saltwater infinity pools. 6 unique villas ranging in 2 to 6 bedrooms, offering the luxury of space that you would expect of a private villa as a freestanding villa or as entire floor leading onto a vast outdoors with saltwater infinity pools. 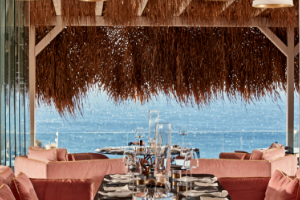 Be prepared for à la carte fine dining at its best at Cabbanes restaurant, possessing an elegant and enchantingly romantic ambience with an extensive wine list. 43 spacious guestrooms, suites, and villa experiences with 6 villas ranging from 2 to 6 bedrooms. 3 delectable restaurants offering seasonal cuisine with locally sourced organic ingredients. 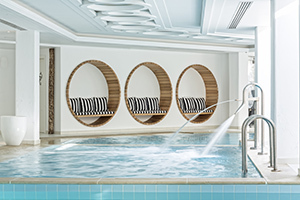 Rejuvenation Spa featuring Elemis and Ligne St. Barth spa amenities and state-of-the-art fitness room. Exclusive saltwater infinity pool with sunbathing terrace. Complimentary shuttle service to and from Mykonos Town operating daily until 1am. Access to the private section at Elia Beach. 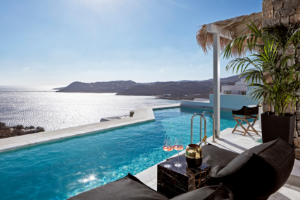 Luxury transfers from and to the Mykonos port and airport upon arrival and departure accompanied by the Villa Manager for Unique Villas. Welcome Champagne and fresh seasonal fruit juices upon arrival for Unique Villas.